From May 2016, airberlin will offer three DIRECT flights per week to the Azores from Dusseldorf. The existing weekly summer flight service to the archipelago’s capital, Ponta Delgada, on the island of SÃO MIGUEL will be expanded by an additional flight. A new nonstop flight per week from Dusseldorf to Terceira, the second most populous island in the Azores, will also be added to the schedule. The archipelago which is almost in the middle of the Atlantic Ocean is now a very popular destination with travelers, thanks to its originality and uniquely beautiful natural landscapes. Outdoor enthusiasts and sport lovers rave about the gorge hiking, mountain biking and kayaking. The island of Terceira is one of the Azores’ lesser-known destinations, offering sustainable, nature-focussed tourism. The island makes an excellent base for discovering the other islands in the Azores by boat or for enjoying activities such as whale watching. Its main attractions include the oldest town in the Azores, namely Angra do Heroísmo, which dates back to the 16th century and is a UNESCO World Heritage Site. airberlin is one of the European airlines flying to one hundred and thirty eight destinations worldwide each year. 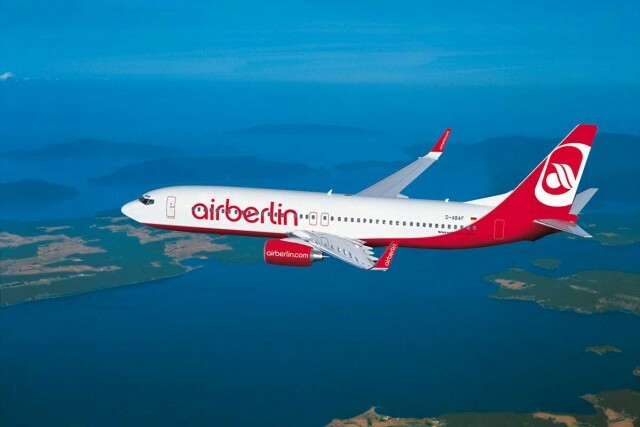 The airline in Germany carried more than 31.7 million passengers in 2014. airberlin offers a global route network through its strategic partnership with Etihad Airways, which has a 29.21% share in airberlin.The fleet is among the most modern and eco-efficient in Europe. Together with other airlines, airberlin belongs to Etihad Airways Partners, a new brand with which Etihad has been uniting shared activities since the end of 2014.